1969 Vintage Wines My 50th Birthday tasting! This Event has been read: 2773 times. "Therefore God give thee of the dew of heaven, and the fatness of the earth, and plenty of corn and wine." Unfortunately, god did not give us plenty of Domaine de La Romanee Conti. One of the reasons that this is one of the most expensive wines on the planet earth is that they only make a few hundred cases of each of these Grand Cru wines from any vintage. The other reason is that they have had a thousand years of marketing in the wine industry. There are not many regions of the wine world that have the history of Burgundy's Cote D'Or and with that history comes a very high price tag. The fee for this tasting is $5000 per person + tax for reservations call 954-523-9463 or e-mail andy@winewatch.com. 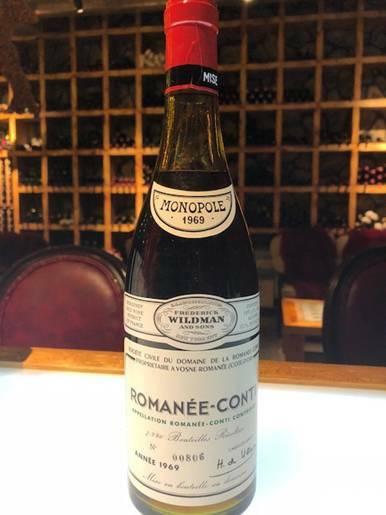 Probably one of the most sought after wines by collectors of fine Burgundies are the wines of Domaine De La Romanée Conti (also called simply DRC). They carry a sort of mystique about them that you only find in collectibles such as a Picasso, or a Rembrant- things that only an elite few can afford to own and even fewer really appreciate. Talk of Lafite or Mouton or the upstart Petrus pales in significance when one considers that this precious piece of earth was a sacred spot five centuries before the first words were ever written about claret. Consider, for example, the significance of that crisp, fall day in 1241 when the landscape was red with the color of wine, and the air was laden with the smell of it. The monks gathered in their Abbey at the Vosne and decided to sell the vineyard of Romanée-Conti. They had owned it for almost 200 years and it was a monumental event when it returned to private hands. Over the ensuing centuries, inheritance laws and the wave of anti-clericism that followed the French Revolution caused the great growths of Burgundy to be divided into a thousand meager plots. So sacred was the vineyard of Romanée-Conti, that it never once sub-divided through nine changes of ownership. The vineyard was once called La Romanée until it was purchased by the Prince de Conti in 1760. De Conti acquired the vineyard only after a great struggle. The other contestant was King Louis the Fourteenth’s mistress, Madame de Pompadour. The prince held a banquet to celebrate the acquisition; underscoring the significance of the event was the fact that it was attended by figures such as Jean-Jacques Rousseau; even a very young Mozart was there to play the harpsichord. When the Conti fled France during the revolution, Romanée-Conti changed hands several more times – among its owners was Napoleon’s banker. Today’s proprietors, the Leroys and the De Villaines, have run the Domaine jointly since 1942. After an emotional power struggle, Aubert De Villaine, who has co-managed the Domaine for 19 years, has emerged from the shadows of the ubiquitous and flamboyant Madame Bize Leroy (who was booted out by the De Villaines and other members of the Leroy family for alleged conflicts of interest). Many critics, in describing these wines, talk of the continuity of house style and the winemaking genius of the Domaine. The quietly purposeful Aubert De Villaine takes a little credit for the greatness of these wines. He speaks of the “genius of the terroir” and of the Domaine’s efforts to keep the winemaking as simple and natural as possible. American viticulturists may think they have a corner on organic farming, but De Villaine notes that the Domaine’s wines are 100 percent organic. There are no sprays or pesticides used in the vineyard. Although De Villaine pays homage to technology and talks of clonal research, he stresses that everything is done to ensure as little manipulation of the wine is done as possible. Except for the 100 percent new oak, which is used with every one of the Domaine’s wines and the fact that as of 1995 the wines are no longer bottled by barrel (which critics claimed caused bottle variation), one gets the impression that things are done much in the same manner as they were 100 years ago. De Villaine is succinct: “There is more to be learned in what not to do than there is in what to do. Nothing is more difficult than to be simple”. There are some wine writers that feel there is somewhat of a secret when it comes to the wines of this fabled estate. Robert Parker of The Wine Advocate has stated that the Domaine’s use of lightly toasted François Frères barrels (the preferred source for most of the great estates of the Côte d’Or), which are air dried for three years prior to use, could have something to do with it. However, Bernard Noblet, the cellar master, has assured that they are neither steam cleaned nor are they rubbed with any special ointments as speculation has suggested. La Tâche is entirely owned by Domaine de la Romanee-Conti, a fact that makes it a "monopole." 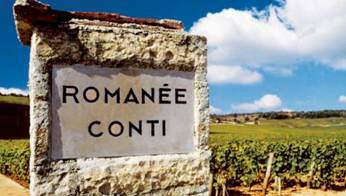 The domaine has exclusive rights on a second vineyard -- the grand cru Romanee-Conti itself. It's almost joined at the hip with La Tache; they are within a stone's throw of one another. And just like the great grands crus from the Côte d'Or, Burgundy's "golden slope," both vineyards are well-drained and exposed to the east-southeast; both tilt down gently on the hillside toward the stone walls surrounding Vosne-Romanee. This village lies in the center of the Cote de Nuits, and its grands crus are the sirloin cut of red Burgundy country: no sinewy tannins, just a marbling of smooth texture. The wines made here are famous for their spicy, perfumy nose, highlighted by cinnamon and earthy notes that rely more on spices than red or black fruits.